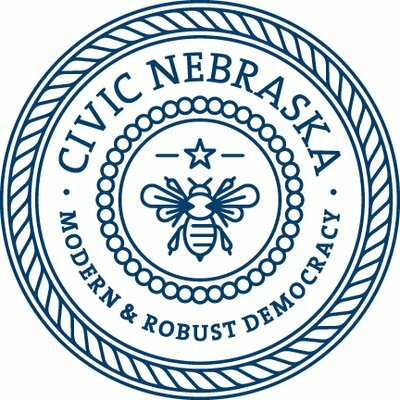 Civic Nebraska is a diverse organization -- politically, programmatically, and geographically. But as a recent staff gathering showed, we are all close together in creating a stronger, healthier democracy in the Cornhusker State. Last week, Civic Nebraska’s full-time staff gathered for an annual retreat. For six hours we put our heads together in the same room to reflect on where we are, where we’ve been, and, of course, where we’re going. Many organizations spend time strategizing, so we’re not claiming to be unique there. But our time together is extra valuable because of the nature of our organization. Geographically, our program areas are literally many miles apart: We’re headquartered in Lincoln and have offices in Omaha; our Youth Civic Leadership programs are in three Omaha schools and one in Lincoln; our Voting Rights Advocacy and our Civic Health Programs, respectively, span the state. So it can be an achievement to get all of us in the same space at the same time. As Civic Nebraska’s communications chief, I focus a lot on the figurative distance between of our three programs. Perhaps, at first glance, that distance may seem to be quite wide. Youth Civic Leadership means we run after-school programs and service-learning clubs. 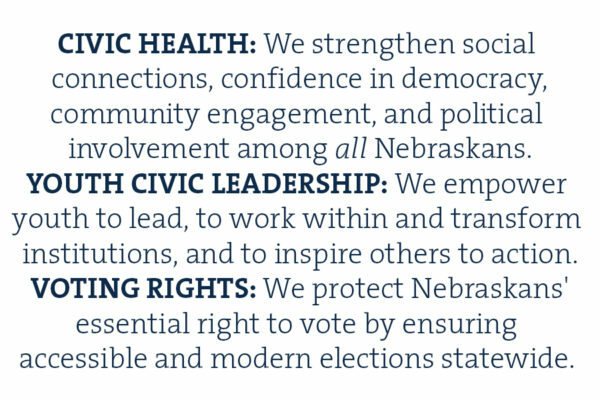 Civic Health means a comprehensive range of initiatives — including but not limited to Collective Impact Lincoln, ONE Omaha, and the Rural Civic Action Program — which drive civic engagement, strengthen neighborhoods and connect communities. Voting Rights Advocacy, arguably our most visible program because of our work with the Legislature, means we’re testifying at the statehouse, observing polling stations on Election Day, and training voting rights advocates across the state. We talked, too, of how tightly each of our programs tie together and rely upon one another, despite the feeling that sometimes we’re literally and figuratively moving in a hundred different directions. That thread was apparent: By embedding civic learning in our after-school programs and clubs, we light the spark of community involvement, engagement, and leadership among our youth. Meanwhile, we lift up their parents, their neighbors, and their fellow Nebraskans to organize their communities so they can collectively identify and address public issues and create positive change. Then, once a culture of civic engagement has taken root, we make absolutely certain that all eligible residents of our state have access to the ballot. When we see this evidence of our programs working in harmony — and we do, every day — we’re often reminded of that popular call-out at rallies and marches. One person will yell: “Show me what democracy looks like!” Moments later comes the response from the masses: “THIS is what democracy looks like!” That’s a glimpse into the “why” of our work. The word might be in our logo, but at the end of the day, democracy is you. On that note, we have another saying around our organization. 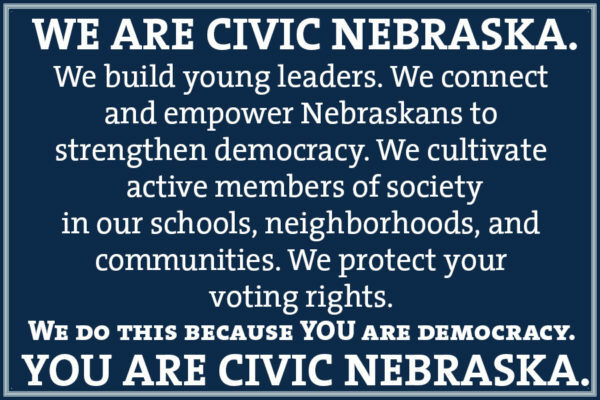 It’s one that ties us together across distance and in our shared cause: We are Civic Nebraska. The past year — our tenth anniversary as an organization — has given us faith that with growing strength, voice, and engagement, You are Civic Nebraska. So the next time we come up in conversation, you can say with certainty how we create a more modern and robust democracy for Nebraskans, from ages six to 106. It’s all right here.